While teaching in college I found myself more and more emphasizing the importance of writing skills. There are very good reasons for that; however, I never really stopped myself and ask the important question: what do students need for developing good writing skills? Of course, one is fast to pick up the general idea that no good writer is a poor reader; hence, I needed to do something to make sure my students knew how to read academic texts efficiently. But where to begin? From personal experience I believe that self assessment followed by reflection is the first step toward growth: why would one seek improvement if one isn't aware of a deficiency in one's skills? The hunt has begun! For a while now I have been reading about assessment scales developed in the psychology literature to assess student work, skills, and understanding. Nonetheless, I only recently came across a sixteen year old paper about the Metacognitive Awareness of Reading Strategies Inventory (MARSI; Mokhtari & Richard - 2002 - Journal of Educational Psychology). After a first reading of the article I became quickly enthusiastic about that scale given its potential. As a good scholar I quickly looked up any follow up article refining the MARSI scale and yes, there was a very recent update (MARSI-Revised; Mokhtari et al. - 2018 - Studies in Second Language Learning and Teaching)! 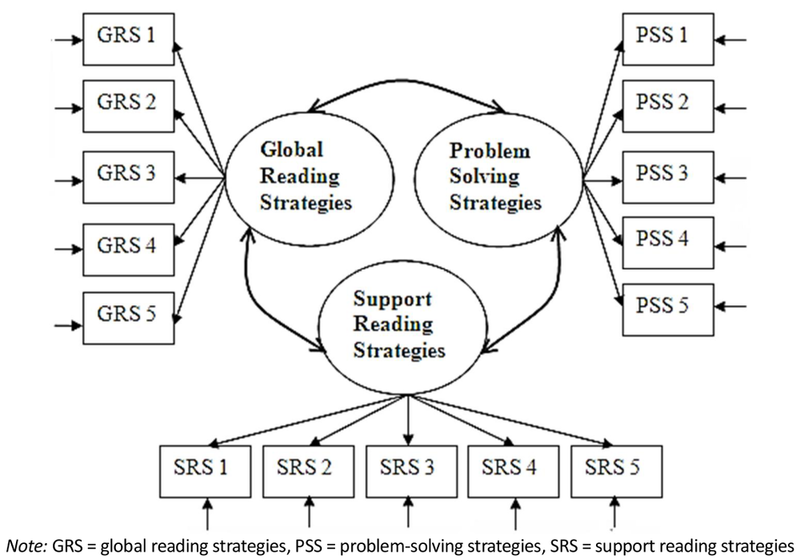 As you can see on the above image, the MARSI-R scale relies on three interconnected reading strategy categories: the Global Reading Strategies (GRS), the Problem-Solving Strategies (PSS), and the Support Reading Strategies (SRS). GRS refers to a general approach to reading often taking place even before starting to read. PSS refers to actual roadblocks encountered during reading and how to deal with them and ensuring the reading is done to understand and not simply decode. SRS refers to strategies that down the line, sometimes way after the reading is done, will ensure a good information retention and understanding. I have never heard of this strategy before. I have heard of this strategy, but I don’t know what it means. I have heard of this strategy, and I think I know what it means. I know this strategy, and I can explain how and when to use it. I know this strategy quite well, and I often use it when I read. Table 1 from Mokhtari et al. - 2018 - Studies in Second Language Learning and Teaching. Once each item has been scored it is very straightforward to calculate an average score for each category and the overall MARSI-R score. The interpretation is a little more complicated though. Indeed, one can refer to the authors' guideline for each score: high level of awareness (3.5 or higher), medium level of awareness (2.5-3.4), and low level of awareness (2.4 or Lower). However, Mokhtari and collaborators were prompt to remind us that the MARSI-R scale was not intended to assess actual reading strategy usage! In fact, MARSI-R only assesses what individuals think they are using in term of reading strategies, it is only a self reported scale. Furthermore, more than a one time assessment of reading skills usage by someone, one can extract the full potential of this scale by taking repeated measurements via MARSI-R along a semester, a year, or a degree effectively assessing one's progression toward efficient reading skills. Here you have it: the Metacognitive Awareness of Reading Strategies Inventory (MARSI) Revised. Click on the link if you want to go ahead and take the scale in its official format and learn more about yourself. Last advice, don't over think it or try to beat the test. This is not a test meant to be aced or taken to compare scores. This scale is only meant to provide you with an avenue for reflection and growth of your own reading skills.